What better way to celebrate than with a GIVEAWAY?! Have you shopped Thirty-One before? Let me tell you how excited I was when Bridget introduced me to the awesomeness that is Thirty-One. 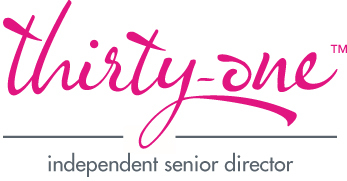 Thirty-One is a shop full of personalized products to keep you organized at home and on the go! I placed an order right away. My daughter and I picnic at the park on a weekly basis with our friends and I have been looking for the perfect picnic blanket. Something convenient, yet cute that I could just keep in the car for our weekly play dates. I absolutely LOVE the travel blanket we ordered from Thirty-One! We use it at the park, in the backyard…it’s even great to use as a blanket in the car on those cold mornings. It’s the best picnic blanket ever. 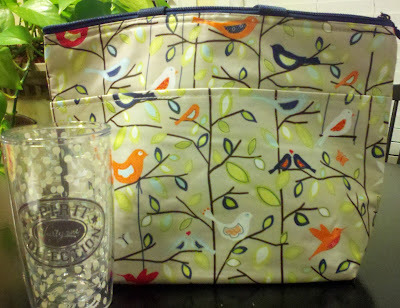 Today, Bridget is giving away this adorable Thermal Tote and Tervis Tumbler ($35 value)! 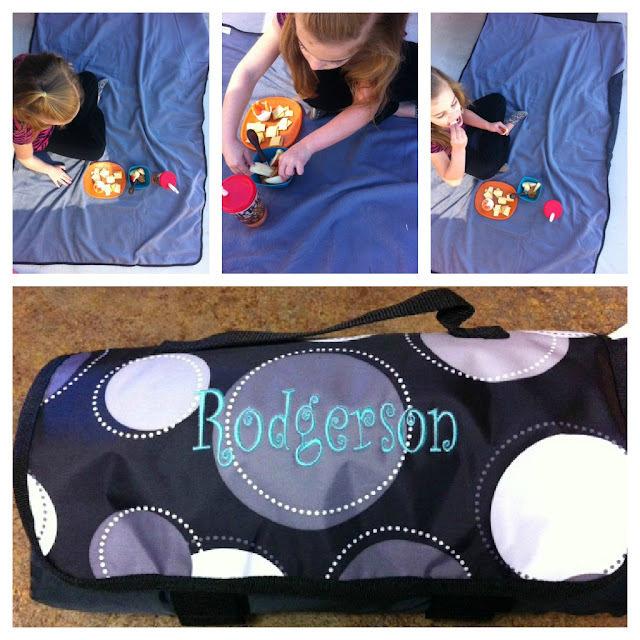 The thermal tote is one of our most popular items! They are insulated to keep your food hot or cold. Makes for a great lunchbox or just a nice place to keep your snacks fresh on the go! Paired with an exclusive Thirty-One Tervis tumbler, you will be ready to hit the road in style! Just visit Bridget’s Thirty-One shop and come back here and leave a comment telling us what your favorite item is! The rest of the entries are extras! Giveaway is open for one week and the winner will be announced right here. Winner has 48 hours to claim the prize or a new winner will be chosen. Thanks so much to Bridget for such a great giveaway! I have a clutch wallet and it is adorable (in yellow). Sleek and sheek baby! Love the keep it caddy! I like the mini utility bins! I have a couple bags from Thirty one and I love them. Next on my list to get is a couple Fold N Files…I work from home and these would be super cute in my office! Thanks for the giveaway! I like the organizing shoulder bag from the thirty one store. Very handy for my little one who just turned 4 months. love the retro metro totes! I love the Large Utility Tote in the Organic Poppy! Thanks for the giveaway! I literally just learned of Thirty-one and was looking at the cargo on the website ! My fav item is the Retro Metro bag…with tiny white polka dots on gray. I have a couple of 31 items, I ♥ the skirt purse (http://thescrumptiouslife.blogspot.com/2012/04/new-fabric-to-cover-my-old-purse.html) and used a 1/4 yard of pretty fabric to cover it when I got tired of my 31 ruffle skirt for the purse. Love the Large Utility tote in any pattern! They are all great and I can think of so many uses for it! Thanks! I love the address labels. Love the super organizing tote! I love their organizing utility totes! I have one I use for my bills (bill paying supplies in pockets & file folders inside to file them) I really want another in Island Bloom print for my gym bag. I love the cinch-it-up thermal tote! It’s just as adorable as it is functional! Why, oh why, did you have to ask for just one favorite? There is NO WAY to pick just one!!! I am in need of a Fold ‘N File. I have a huge list of others I want, too! I like the retro metro tote. I like tge market thermal tote! It woukd be great fo picnics or for grocery shopping. The Retro Metro Tote!! LOVE!!! I have been wanting the inside out bag!!! !